In Edinburgh 2014 Nathaniel Metcalfe performed his second Fringe show. On the very last day, he broke up with his girlfriend of four years. He hasn’t been back since. It doesn’t take a great psychologist like Frasier Crane or Cracker to realise that these things might be related. 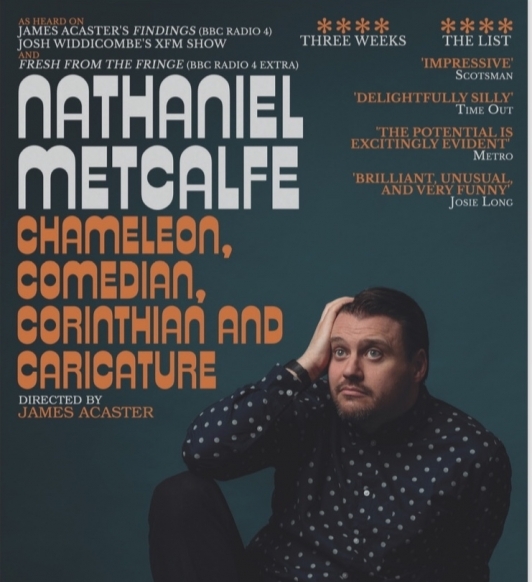 Returning for his third solo show at the Fringe, Nathaniel investigates what it means to be an “artist”, taking inspiration from such notable figures as David Bowie and Jeremy Irons. Mildly anticipated new show from the ‘delightfully silly’ (Time Out), Josh Widdicombe’s XFM Show regular, who has also been heard on BBC Radio 4 and BBC Radio 4 Extra. Directed by James Acaster. After starting a stand-up career in 2007 and doing a mere five gigs, Metcalfe got through to the semi-finals of So You Think You’re Funny. In 2010 he reached the semis of the Laughing Horse New Act Of The Year and the final of the Hackney New Act Of The Year, and in 2013 took his debut show Enthusiast to the Fringe – where it was named one of the top ten shows in the Amused Moose Laughter Award. On radio, Nathaniel was part of James Acaster’s Findings on BBC Radio 4, and BBC Radio 4 Extra’s Fresh From The Fringe as well having his own regular feature Radio Get With The Times on Josh Widdicombe’s XFM Show. He is currently the co-host of Fan Club with Nick Helm on FUBAR Radio.